Safaricom has today recognized Dennis Muthii from Kirinyaga County for being its 30th Million customer. The telco will undertake to fulfill his ambition of joining a leading technical institution in the country whereby it will fund his tuition and upkeep as he studies mechanical engineering. 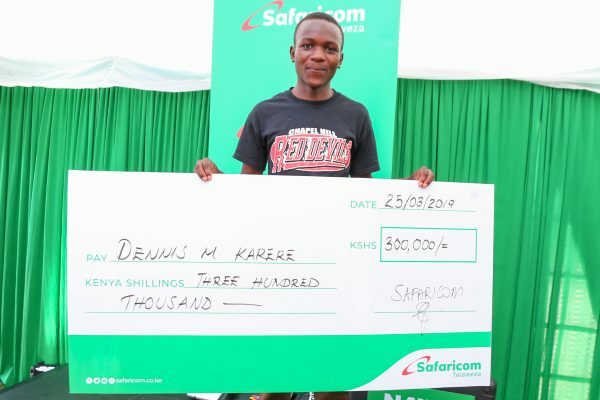 Denis apparently bought a Safaricom line in Kerugoya town, shortly after completing his Kenya Certificate of Secondary Education to always be in touch with his family. He has been working as a carpenter for the last two months before transitioning to a mechanic a week ago after joining his brother’s garage in Embu town. Dennis will join more than 3,000 youth who are set to benefit from a separate KES 132 million Technical, Industrial, Vocational and Entrepreneurship Training (TIVET) program by the Safaricom Foundation. Announced in February 2019, the program will focus on entry-level training for four key areas within the construction industry specifically welding, plumbing and electrical engineering. The funds will be used for student’s fees, teacher training, setting up smart classrooms and construction of state of the art workshops.